Looking to join a competitive swim team? How about joining a seasonal league? The Aquatics Division has many different types of swim teams to join, whether you are an adult or a child, and no matter how well you swim. Take a look below at the many different offerings. There are three or four seasonal leagues each year plus a year-round program in which children can participate. The seasonal leagues are developmental swimming programs designed for instruction in the four competitive strokes (freestyle, backstroke, breaststroke, and butterfly). Success oriented competitive experiences will also be offered through ATAC developmental meets and USS invitationals. Leagues usually run for 8-10 weeks and are for beginner and intermediate swimmers. Each league consists of five one-hour practices each week with scheduled meets. The year-round competitive program and the leagues are for children ages 5-18. While no previous experience is necessary, participants must be able to swim 25 yards, without stopping, using a proficient freestyle stoke breathing to the side. For more program information and for specific registration dates, times and fees, please visit our ATAC Website or call 891-4906. The Tallahassee Serinas Synchronized Swim Team is offered for girls ages 8-18. Beginner and Advanced levels are available. 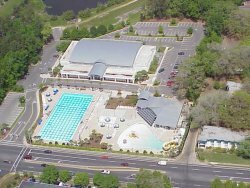 For more information, please visit www.serinas.org or contact the Area Tallahassee Aquatics Club and Tallahassee Serinas office at 891-4905.